Mouse anti Human RAP1A/B antibody recognizes the Ras-related protein Rap-1b, also known as GTP-binding protein smg p21B, Ras family small GTP binding protein RAP1B or small GTP binding protein. RAP1B gene encodes a member of the RAS-like small GTP-binding protein superfamily. Members of this family regulate multiple cellular processes including cell adhesion and growth and differentiation. This protein localizes to cellular membranes and has been shown to regulate integrin-mediated cell signaling. This protein also plays a role in regulating outside-in signaling in platelets. Alternate splicing results in multiple transcript variants. Pseudogenes of RAP1B are found on chromosomes 3, 5, 6 and 9 (provided by RefSeq, Oct 2011). 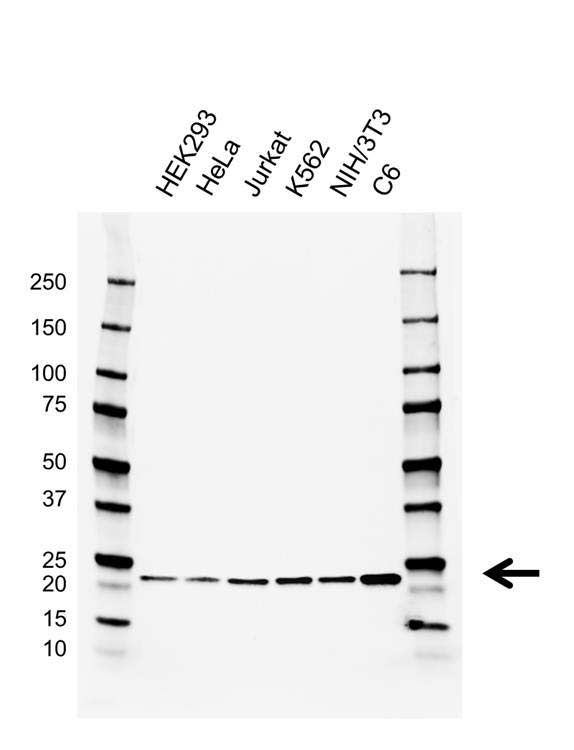 Mouse anti Human RAP1A/B antibody detects a band of 21 kDa. The antibody has been extensively validated for western blotting using whole cell lysates.